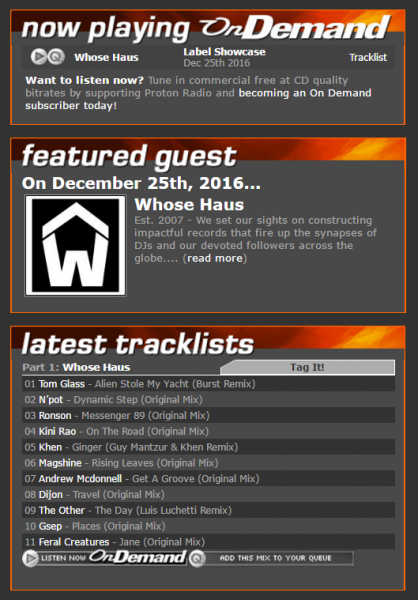 This past 2016 on December 25th, 12 EST the 2nd edition Whose Haus Label Showcase aired on Proton Radio. This edition featured label artists Guy Mantzur, Khen, Tom Glass, N’Pot, Andrew McDonnell, Burst, Kini Rao, Luis Luchetti, Feral Creatures, Magshine, Ronson, Dijon, and The Other who are all part of our diverse artist family! This radio broadcast was another way we were proud to celebrate 8 years of releases on Beatport and on vinyl. Special thanks to everyone @ Proton Radio and thanks to everybody who for all these years have continued to show support for our artists. Your support is much appreciated and helps give us energy to continue striving to always push our industry forward making inspiring electronic music!